This Chess Informant book is not only first rate in content but also in production. Highly recommended! I didn’t know any chess book that merited the word ‘Definitive’; now I do. Big claims need big justification, but this book is extraordinary. It attempts to describe all the themes, the ideas, that chess problems use, and it succeeds in that formidable task. 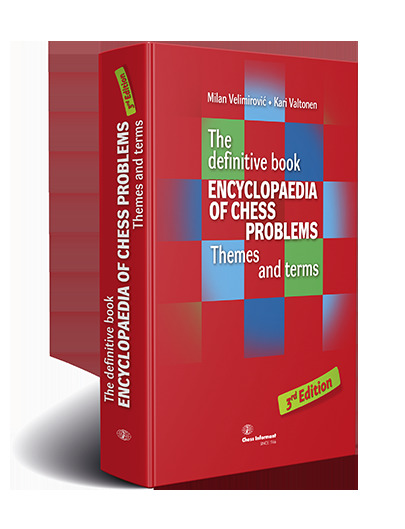 This comprehensive encyclopedia is special in our field of chess composition and will be enjoyed by chess players as well. It is a must in the library of all lovers of chess problems and studies. Milan Velimirovic (1952-2013), was a GM of Chess Composition, GM Solver and International Judge of chess composition. He published several books and numerous articles on chess composition. Velimirovic was one of the most respected members of chess problems community worldwide and a regular columnist in Chess Informant. Kari Valtonen (1954) is GM Solver and International Judge of chess composition. Editor of the chess composition section of “Suomen Shakki”, sub-editor of chess composition magazine “Suomen Tehtäväniekat”. Author of several articles on themes and terms in chess composition. World Solving Champion in 1984. Living in Tampere, Finland.